This works for a mini package service to ensure local city tour facilities to our clients travelling in Mussoorie. We offer this service for half day car hire services including Airport Transfer in Mussoorie, Car rental service for Marriage, party and event, Corporate Cab Rental in Mussoorie, Railway Transfer, visiting hospitals and a lot more. The service is extremely useful for travellers looking for pickups and drops facility from one destination to the other within Mussoorie such as airport pickups and drops, hotels pickups and drops, railway station pickups and drops, and bus stand pickups and drops. Our trained chauffeur will reach the appointed destination in time dressed in uniform. We have designed special packages for outstation travel. These are a perfect way to spend time with friends and loved ones outside the city limits. The package is arranged as per the interests and requirements of our clients. We also arrange for group packages from Mussoorie to places nearby. The cars sent across will accommodate group size to ensure maximum convenience. This is a typical to and fro service offered in Mussoorie for those who would like to make to and fro trip to Mussoorie. We offer this service to multiple destinations from Mussoorie. The package has been devised as one way service to serve our clientele for one way drop to their destinations from Mussoorie. The package makes for an ideal choice for those visiting multiple cities within a fixed period of time. We also offer special Mussoorie city sightseeing tours and any other customized cab rental packages. 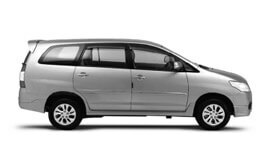 At My Taxi India, we guarantee the best car rental services in Mussoorie at highly affordable prices. Mussoorie enjoys a borderline humid subtropical climate and tropical savanna climate. The place enjoys 3 distinct seasons namely; summer, monsoon and winter. As per the 2001 India census, Mussoorie had a population of 26,069. Tourism makes for the major share of economy in Mussoorie. It is the major segment of revenue for the hill station. Mussoorie is an exquisite destination about 273.8 km from Delhi. The city is beautifully Perched on a ridge which is about 2 km high. Also referred to as the ‘Queen of Hill Stations’ Mussoorie is Uttarakhand’s most favourite holiday destination. It is widely revered for its scenic beauty and outstanding views of Shiwalik Ranges and Doon Valley. Some of the most popular places to visit here include Nahata Estate, GunHill, Kempty Falls, Lake Mist, Municipal Garden, Mussoorie Lake, Bhatta Falls, Jharipani Fall, Mossy Fall, Sir George Everest's House, Nag Devta Temple, Mussoorie and Landour, Jwalaji Temple (Benog Hill), Cloud End, Van Chetna Kendra, and many more.